It may be either too cold or too wet for us to get to work in the garden or plot but it doesn't stop nature doing its thing as I found out when I took my camera for a walk around the garden. The album can move along a bit quickly but if you hover over the caption area you can access the manual controls. Click on the image to view larger versions. PS I have managed to slow the album down thanks to a bit of code sent to me by Phil KL and also changed the black background which was a bit of a distraction. Thanks Phil. It's always a little sad when the red dots disappear! I use a utility called Clustrmaps which is just one of the ways you can get some idea of where your blog visitors come from. You may have noticed it on the sidebar of this blog. It's always interesting to watch the red dots that indicate visitor locations building up on the map but at the end of each year the map is cleared and archived and it's back to square one. That happened this week. When his happens I like to keep a record of ‘the dots’ and have done so for the past couple of years on my website. Not all visitors show up on the map but it always amazes me to note the range of locations represented. I know some visitors are likely to have just accidentally stumbled on to the blog and then made a hurried departure, having no interest whatsoever in its contents, but I'd like to think some people stick around and maybe come back again for a second visit or even more. We all have our own reasons for keeping a blog and I didn’t set out when I started mine with the intention of attracting an audience, however I have always slightly envied those who boast huge lists of Followers and who have dozens of people commenting on their posts. I know I can’t compete on that scale but I would like to thank those of you who have been kind enough to post comments and also those who have become followers of my blog and also have popped comments in the guestbook of my website. It’s good to know that I have made some sort of contact with some other ‘real’ people out there. Living up to its name! 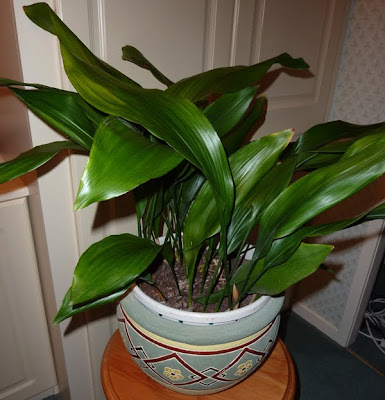 About 30 years ago my grandma gave me what was left of her once thriving aspidistra saying, “See what you can do for that!" It was already at least 50 years old and had been reduced from its former glory to one poorly looking leaf set in smelly, soggy compost. My grandma had been told that it was beneficial to feed the plant with tea and so she had tipped the dregs from cups of tea complete with milk and sugar into the compost. Taking the plant home I didn’t really fancy my chances of restoring it but was keen to try my best as this wasn’t just a plant but a piece of family history. 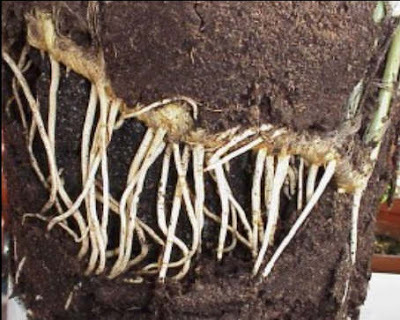 The plant was removed from the pot and all compost was washed away from the roots. 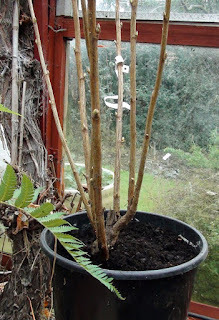 After being planted in fresh compost it was then left to make an effort to regenerate itself. Within weeks new leaves were sprouting and I soon had a healthy looking plant with several large leaves. It later even flowered which came as a bit of a surprise as I didn’t know they did! The flower was really unusual, a purplish daisy shaped flower sitting on top of the compost hidden under all the leaves. Flowering was a once only occurrence as in spite of keeping a watchful eye on my plants I have not seen another flower since. Apparently the flowers are pollinated by slugs and snails which doesn’t surprise me as these pests do like to munch at the leaves. Maybe that should come as no surprise as aspidistras are related to hostas and we all know how much slugs love hostas. The plant itself grew so strongly that it eventually burst its pot so I split it and ended up with about five new plants. Some of which were given to other members of the family. 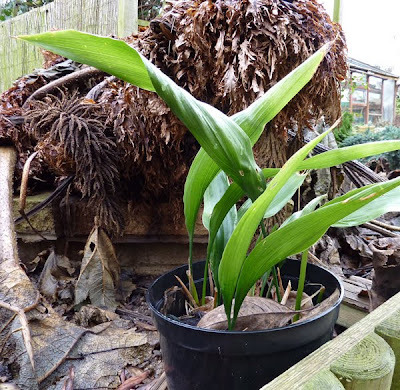 At present I have four plants which are really too many for any average household so having read that aspidistras can be planted in the garden a couple of years ago I placed two pots outside popping them in the cold greenhouse to overwinter. 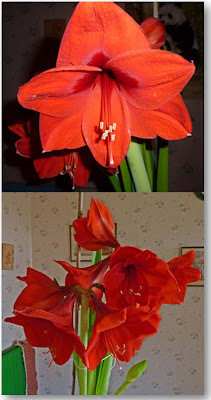 This winter I decided to leave one outdoors to see just how well one of the plants would live up to its popular name of the “Cast Iron Plant”. It has been out in the recent period of prolonged freezing temperatures, at times under a thick covering of snow but yesterday I noticed it was still looking healthy and green. Just a bit of nibble damage so it really is a cast-iron plant in all senses. One way to keep warm on the plot! We made our second visit of the week to the plot yesterday but didn't stay long as it was bitterly cold. It's still too soggy to do much. 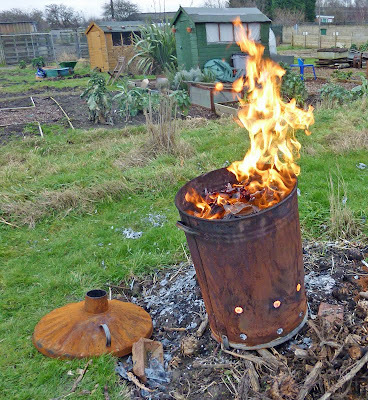 Just long enough to spray the fruit trees with a winter wash and burn a few perennial weeds which also provided us with a little bit of warmth to ward off the chill. I also managed to take my monthly photos to add to my website diary. I also potted up the perennials bought earlier in the week and it looks as though I may be lucky as most of them have small shoots so are definitely still alive! Companies that I have ordered from keep sending me emails about special offers most of which I have a quick look at and then ignore but this latest from Thomspon and Morgan looked interesting and maybe even tempting. They are offering five osteospernum - Falling Stars plants for £2.99 rather than the original price of £9.99. Trouble is you have to add on postage and packaging. All birds will go into hiding next weekend! 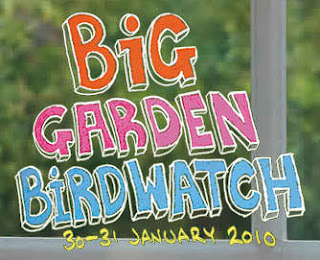 Next weekend the RSPB Big Birdwatch will take place. This means that all birds in your immediate area will go into hiding. For the past 30 years the RPSB have been asking people to spend an hour on a particular weekend counting the birds that they see in their garden or nearby parkland. This helps the RSPB determine which species of bird is thriving and which is struggling and then to focus their activities appropriately. You can carry out the count in the comfort of your own home by just watching the birds from your window and counting the highest number of birds of each species you see at one time during the hour that you are watching. 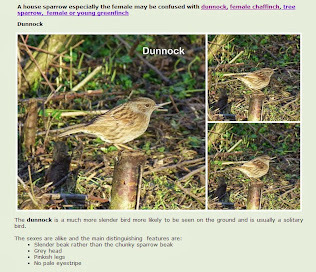 If your knowledge of garden birds is a bit shaky the RSPB even provide identification sheets and an online bird identifier to help. If you prefer you can also join one of the bird count events that are being held all over the country. We have taken part in the count for several years now and each year it seems that on Birdwatch weekend the birds make themselves scarce so we are preparing for a weekend when the bird feeders remain full and the fat cakes unpecked. We have a fairly new flower bed in our garden that we just haven't yet managed to get how we would like it. I want a sort of cottage garden look with some plants at least that will attract butterflies and bees. When visiting a local garden centre near to us I noticed that they were selling perennials at only £1.99 each. These were packed in plastic bags filled with compost so I suppose they could just refuse to grow but we decided at the price we would try a few. Some were named varieties but others weren't which doesn't bother me too much as I want some colour so I'm not too bothered which varieties I have bought as long as they perform. Anyway I'd only lose the name labels and forget which varieties I have bought! The plants will be potted up and kept in our cold greenhouse for the time being and then fingers will be crossed. I already have one or two blue/purple flowering plants growing in the bed so the colour scheme isn't going to be sophisticated. I don't know whether the plants will enjoy the conditions in the bed or not but at the price it's worth the risk. Has anyone any favourite easy growing perennials that they would recommend? The soil is clay but with plenty of compost added, it is under a crab apple tree which we intend to prune back a little and does get rather dry (that's a joke at the moment) but it is in a light position. So far the plants that seem to be doing well in the border are the ones shown on the right. I have a couple of penstemons, the white flowering one has brown leaves, a couple of heuchera - Plum Pudding and Pewter (which has silvery leaves), some dicentra, a low growing geranium with brown leaves, a clump of bergenia, a veronica and a salvia. Wish I could remember the names of all the varieties but my list is in a safe place! Today the raspberry canes that were held up by the bad weather have arrived. The parcel was huge and the plants were well protected in straw and polythene. As we only had notification that they were on their way yesterday they haven't spent very long in transit and look freshly dug. The plants came from Keepers nursery who specialise in fruit. It's the first time we have ordered from them and are so far impressed. We ordered three types of raspberries - Glen Magna, Glen Ample and Glen Moy which should give us an early, mid and late season harvest. (Glen Moy has sold out so I have linked to another supplier for information on this variety). Along with the raspberries were four blackcurrant bushes - Ben Lomond and Ben Connan and a quince tree - Meeches Prolific. As the condition are still not ideal for immediate planting the blackurrants and quince have been potted up into large pots and the raspberries potted in variety bundles. They'll stay in our cold greenhouse which will afford some protection until they can be planted out in their final positions on the plot. Last week once again the weather kept us from the plot. For more about our weather click here. At least this week the rain kept off for long enough for us to add to our vegetable store. 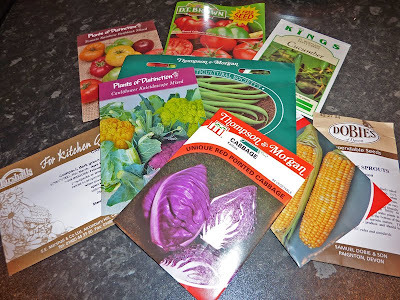 The good news is that all our seeds have now arrived. We are just waiting for potatoes and raspberries. Never mind though they look beautiful whatever the colour. 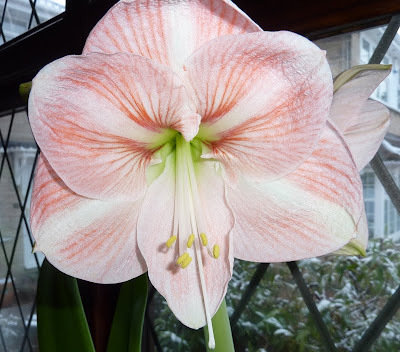 The third stalk of my sister's bulb is now flowering too. For my complete January diary entry for last week click here. I have just had an email contact to my website from someone offering to deliver and supply horse manure. "I personally own 4 show horses that I show on a county level all over the country and have on offer a large quantity of manure. The manure is well rotted and seems to have high worm content. The bedding we use is cardboard rather than the usual of straw or wood shavings which I personally think is much better product for bedding as it rots down much better and quicker. All my horses are fed the best in hard food and again the best hayledge I can find so in turn I suppose the muck would be as good. I would like to offer this manure to any allotments FREE and I can deliver this to site FREE but it has to be in a minimum of approx 3 ton loads. The delivery vehicle would a skip wagon the size of say a builders' type skip so we can basically tip the manure in a few mins". "To the very best of my knowledge no herbicides have been used in the production of the hayledge and the horses I own are on my father's land in Hartshead with nothing more than cows grazing and grass grown in the near by area. The hayledge itself I collect from a farmer Thorner near Bramham who deals in the sale of this to many racing stables etc. He is one of the best growers of this in the area. The cardboard bedding I use is produced by my company Gwyn Davies Recycling and this is all brand new cardboard collected and recycled from leading package companies as redundant stocks." The art of knowing when to stop! Well once I had started tweaking my blog I just seemed to carry on. I found out how to get back the shadow border after a little playing about with the html coding etc. The shadow border is actually an image that repeats down the page and because I had widened the posting area it was hiding behind this. Then I decided that it would be good for My School Vegetable Patch blog to match my School Vegetable Patch website. This meant changing the background colour. As the website system that I use doesn't provide access to the code I had to try and match the background colour of the blog to the website which was easier said than done. Any way I think it's about right now. Then the shadow border was the wrong colour so I had to change that. All that was left then was to remove the diamond striping as this no longer matched my scheme, so I created a new border for the header. 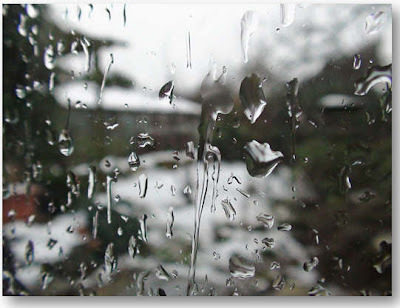 As someone noted in the last post comments - lots of people use the template that I had chosen - there aren't too many ready made templates to choose from - so I decided that I would change the schemes for this blog and Green Lane Weather Diary blog, (with my husband's permission as he looks after the weather blog), to match the other two so that I could have a personal scheme rather than one shared with so many others. I hope vrtlarica who posted that he/she wasn't keen on the green likes this green better! 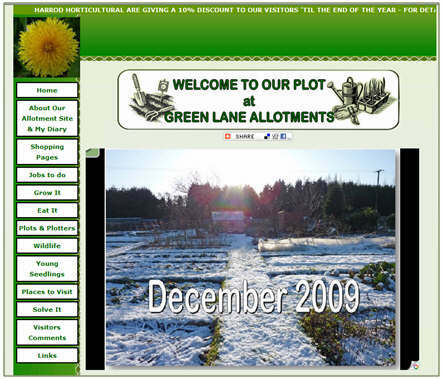 Now I need to work out how I am going to make the Our Plot at Green Lane website fit in with the scheme. And the ironing is waiting for my attention too!! I said that I couldn't stop - I thought that maybe the sidebar and main panel merged together and so I have experimented with making the sidebar a different colour and adding a border - I've tested this out on my test blog here. If you have a moment to have a look and tell me what you think that would be great! I've been messing about with ideas for revamping this blog and would love to know what you think! If you could spend a couple of minutes visiting this link and having a quick look and them posting some feeback I would be really grateful. I've copied a couple of posts etc to get some idea of how things would look. I have experimented with changing the width of the whole of the blog and the proportions of the main area and sidebar and also changed the header. If you could post a comment that would be great. Harrod Horticultural are continuing to offer 10% discount on their range of timber raised beds and netting etc for anyone ordering from them after linking from any of my Harrod links from this blog and sister blogs and websites. To qualify you must also quote Green Lane at the checkout. 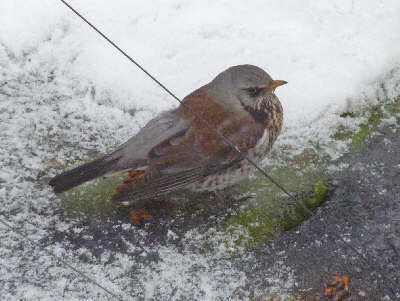 The latest visitor to our garden drinking hole was this fieldfare. Not a brilliant photo as it was taken full zoom from a bedroom window. It does show how desperate birds are to find drinking water though. It is a bird we don't often see in our garden. 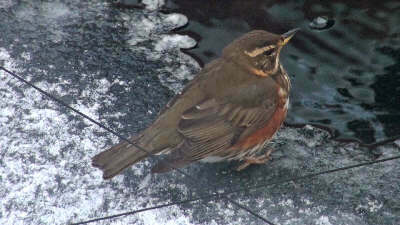 It was followed by a close relative the redwing. Both are related to the song thrush as are the blackbird, robin and dunnock. The only member of the thrush family that hasn't visited us so far is the mistle thrush. It's as near to gardening as we get at the moment! 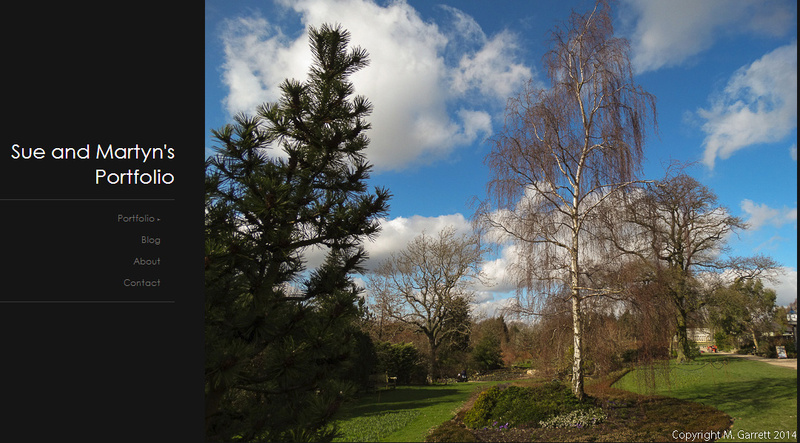 Posting on the blog is as near to gardening as we can manage at the moment. I have even managed to give the website a 'spring clean'. Despite the poor weather seed orders are starting to arrive. Melon - Noir des Carmes - which is supposedly one of the easiest melons to grow. I hope this is true as we haven't had a lot of success with melons. Peppers - Jimmy Nardello's & Tequila Sunrise both are carrot shaped sweet peppers. Jimmy is reported to be the best sweet pepper I will ever taste and Tequila is a golden orange colour. Tomato - Amish Gold which is said to produce huge solid yellow tomatoes. We have also ordered a few flowers to give some extra colour and attract the beneficial insects as well as provide cut flowers. Cosmos - Versailles Palace - which is great for cutting. We always have a patch of cosmos. It usually self seeds and produces some interesting colours but I guess this may not happen this year. Papaver - Ladybird & Cherry Glow, - we already have some poppies that come up every year around the plot even though we haven't actually planted any before. We have quite a variety of colour as they must cross pollinate. (Shown in photo) If they come up in an inconvenient spot they are removed but otherwise they are left to do their thing. 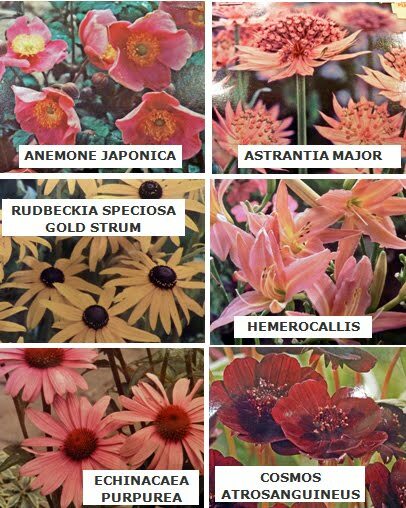 Maybe we will have even more cross pollination when we add these varieties. Achillea - Flowerburst - we have several achillea on the plot again for cut flowers and to attract the insects and they are really good 'doers' as well as being really attractive so this variety will add to our colour palette and some may even end up in the garden. “Chitting” is no longer regarded as essential. It is a hangover from mid Victorian times when all varieties were late maincrops requiring a long growing season. Modern varieties have a shorter “biological clock” and if they are started early they finish early with loss of potential yield. Better to keep them cool with the smallest possible bud and plant into warm soil. 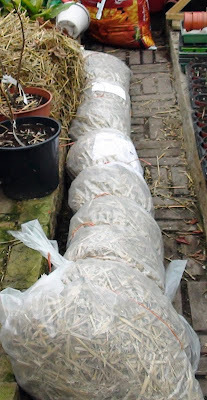 It is always possible to bring on a small number of earlies for earliest possible crop by chitting in a warm room". This just adds to the perennial debate about whether or not you should chit your potatoes. Our seed potatoes usually arrive well before we want to plant them and so we tend to have no choice about whether to let them sprout a little or not. Maybe this year it will be different. Maybe the bottom line is do what works for you and maybe it just doesn't really matter one way or another! We have ordered several varieties of potatoes. We always do this as in this way usually the conditions suit at least some of the varieties grown and we have a decent crop that sees us through the year. This year we have ordered Charlotte, International Kidney, Juliette, Lady Christil, Nadine, Nicola, Red Duke of York, Sarpo Mira and Ulster Chieftain. We tend to go for salad varieties as we find they suffer less from slug damage. If you haven't bought your seed potatoes yet, Alan Roman has a good range of varieties with information about each one that helps in choosing a potato right for you and where you grow your potatoes. Click here for their website. Even the birds are talking about the weather! There seems to only one thing to occupy us at the moment and that is keeping the birds supplied with food and water as the snow continues to keep on coming. 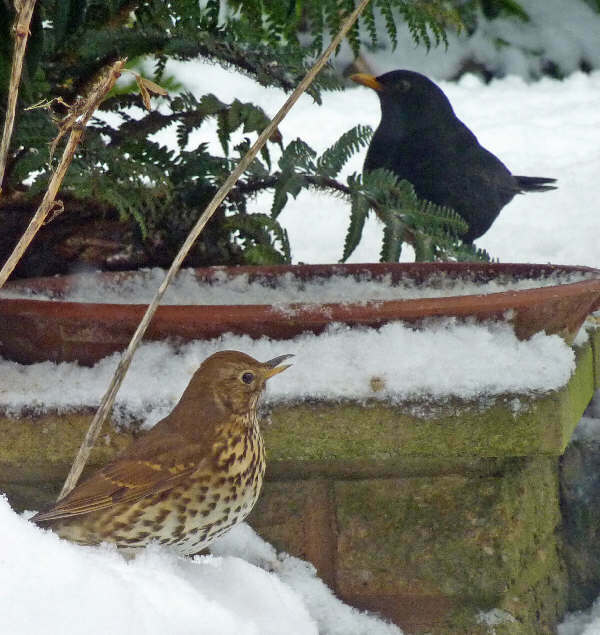 People are reporting record numbers of blackbirds in their gardens squabbling over any food being put out for them. Someone counted 15 of them at one time. 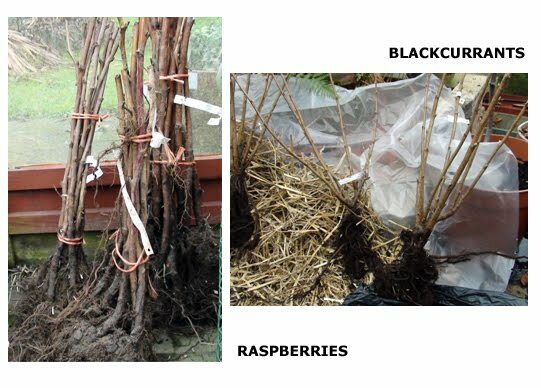 We ordered some new raspberry canes this year which were due to arrive this week. On Monday we had an email from Keepers saying because of the very cold weather and frozen ground they were unable to lift and dispatch them at present. They promise to resume deliveries as soon as weather permits. This was followed yesterday by a newsletter from Alan Roman saying our seed potato order will not be dispatched until the weather improves. We're happy as this means we won't have to worry about what to do with plants etc arriving in freezing conditions. I've thought for a while that my website home page was a bit messy and so I have spent a little time revamping it. I hope it will also make it a bit easy to find your way around the different sections. Many people stumble across the website when trying to access information about contaminated manure but it's not just about manure so visit some of the other pages too. Any ideas for improvements are always welcome. It's always good to see an old friend after a long absence. Several years ago thrushes were regular visitors to our garden and then they just seemed to disappear. 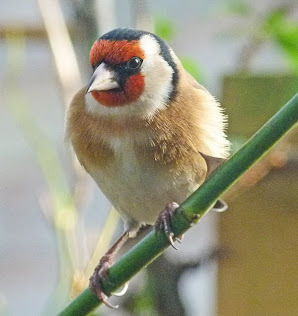 Then last year we would occasionally spot one in the garden or at the allotment. Even without actually seeing them you could guess they were about as small piles of broken snail shell were spotted near to large flat stones. Whenever I weeded or dug I made sure the stones were put back in place. The thrushes use the stones as anvils to smash the snail shells. We also found broken snail shells in the garden and suspected a thrush was at work there too. During this latest cold spell a thrush (or it may be more than one) has been a constant visitor to our ground feeding stations. It especially enjoys Golden Chorus and Mealworm Crumble (sounds delicious doesn't it?). They are more expensive than standard bird food bird as they say in the shampoo advert - "it's because they're worth it!" The RSPB birdwatch is at the end of January so I bet it goes into hiding when we decide to carry out our count! 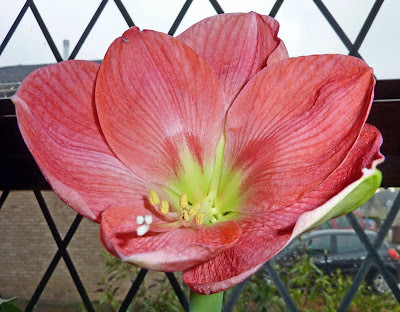 As predicted I lost the race to have a flower on my amaryllis first. My sister's plant now displays two fully flowering stalks with another bud waiting in the wings. She is finding it difficult to keep her top heavy plant from falling over but it looks spectacular - as they always do. To all our visitors everywhere. 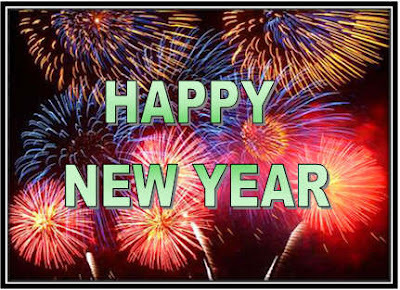 I hope that 2010 is happy, fruitful, vegetableful and flowerful.